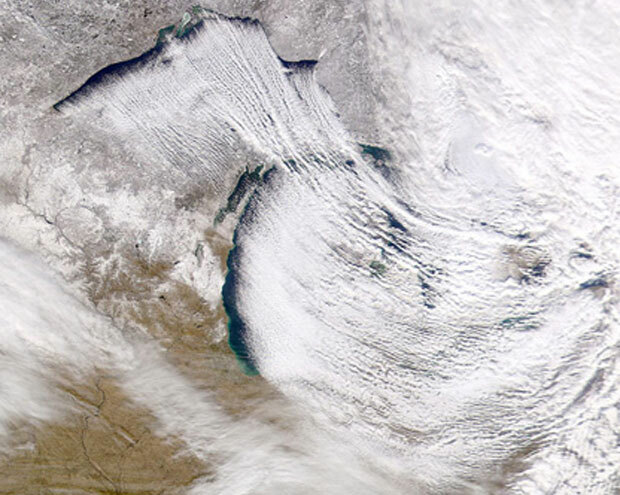 One of the unique characteristics of the Great Lakes is the Lake-Effect Snow Machine. In the Great Lakes region during the winter, cold winds usually prevail from the northwest producing dramatic lake-effect snowfall on the southern and eastern shores of the Great Lakes. This lake-effect produces a striking difference between the snowfall experienced by communities downwind of the lakes and those near or lying on the northern and western shores of the lakes. 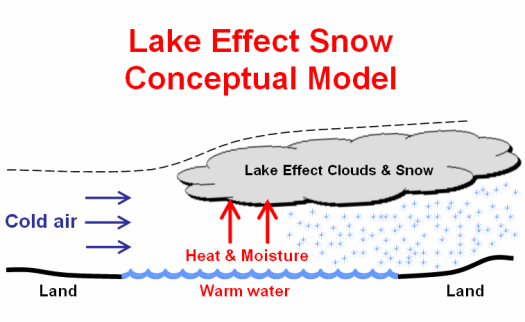 Lake-effect snow forms when cold air passes over the warmer waters of a lake. Water holds on to heat more than air. As a result, below freezing air often passes over much warmer water. This causes some lake water to evaporate into the air and warm it. This warmer, wetter air rises and cools as it moves away from the lake. When it cools, it dumps all that moisture on the ground. If it is cold enough, that moisture becomes snow. If the winds and temperatures are right, the air acts like a big sponge that sops up water from the lake and wrings it out on land. The direction of the wind is important, if the wind is blowing in a direction that covers more of the lake, the air will take in more water. The greater the temperature difference the more water the air will take in. All that water picked up from the lake normally travels no further than about 25 miles before falling, but it can sometimes travel as far as 100 miles. Lake-effect snow generally slows down around February as that is when the portions of the lakes begin to freeze over, making it impossible for the air to steal moisture away from the lake. Lake Effect Snow (LES) is very common across the Great Lakes region during the late fall and winter. LES occurs when cold air, often originating from Canada, moves across the open waters of the Great Lakes. As the cold air passes over the unfrozen, and relatively warm waters of the Great Lakes, warmth and moisture is transferred into the lowest portion of the atmosphere. 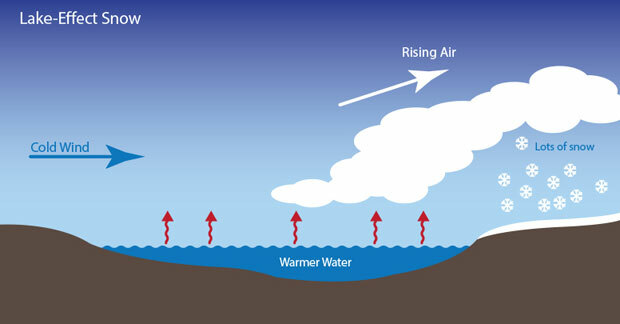 The air becomes warmer and less dense than the overriding cold air, so it rises. The rising air ultimately leads to cloudiness and snow on the leeward sides of the Great Lakes. National Weather Service (NWS) meteorologists must consider many factors when forecasting the intensity and location of Lake-Effect Snow (LES). Many are associated with the prevailing meteorological situation, while others are a function of the local geography. A few of the meteorological factors that impact LES include air temperature, instability (as approximated by the lake to air temperature difference), cold air depth (inversion height), upstream moisture (relative humidity), large-scale lift, and winds. The physical geography of the land and water is also important; including aspects such as fetch, elevation, and shoreline orientation. The Upper Peninsula of Michigan features one of the largest and most distinct Snowbeltâ€™s in the United States. Due to their large area and depth, Lake Superior, Lake Michigan, and Lake Huron freeze less completely. With open lake water throughout the winter months, lake-effect snow can fall continually across the Upper Peninsula and Canadian Snowbeltâ€™s. From the Porcupine Mountains and the Keweenaw Peninsula to Whitefish Point, snowfall is dramatically enhanced by lake effects. In some areas, annual snowfall totals commonly exceed 250 inches per year. The Keweenaw Peninsula, which averages more snowfall than any location in the United States east of the Mississippi River, owes much of its winter snowfall to lake effects. For comparison, Duluth, Minnesota, which lies outside the lake effect zone at the southwestern tip of Lake Superior, receives 78 inches per season. Western Michigan, Northwestern Lower Michigan, and Northern Indiana can experience heavy lake-effect snow. As winds pass over Lake Michigan and generate snow, areas near Traverse City, Muskegon, Grand Rapids, Kalamazoo, South Bend, and Elkhart can experience significant, often disruptive, lake-effect snowstorms. These snowfall events can reach far across Michigan and Indiana, but typically diminish significantly in severity before reaching areas such as Lansing or Fort Wayne. Under the right, relatively uncommon conditions of northerly winds, a single band of lake-effect snow may form down the length of Lake Michigan, producing intense, but localized, snowfall in Northwestern Indiana. Much of Southern Ontario west of Lake Huron can experience intense lake-effect snowfall and notorious whiteout conditions. The greatest accumulations typically occur on the Bruce Peninsula, which divides the main body of Lake Huron to the west from Georgian Bay to the east. Bounded by the lake on all sides except to the south, the Bruce Peninsula experiences lake-effect precipitation during most winter weather events, except when the wind is directly from the south or when Lake Huron is significantly frozen over. The region east and southeast of Lake Ontario frequently sees daily snowfall totals that are higher than anywhere in the United States. Syracuse, New York, receives significant lake-effect snow from Lake Ontario, averaging 116 inches of snow per year. Lake Erie produces a lake effect zone stretching from the eastern suburbs of Cleveland, Ohio to Buffalo, New York. Because of its relatively shallow depths, Lake Erie has the distinction of being the only Great Lake capable of completely freezing over. As it freezes throughout the winter and the fuel supply of moisture from the lake surface is cut off, lake-effect snow events cease. Lake-effect snow is far less common in areas that are far enough inland or upwind from prevailing northwesterly winds over the lakes. Therefore, regions that see less lake-effect snow are typically those on the western and northern shores of the lakes, including Southeastern Michigan, Northwestern Ohio, Southeastern Wisconsin and Northeastern Illinois. However, lake-effect snow is possible when winds are out of the east or northeast. More frequently, the north side of a low-pressure system gathers more moisture as it travels westward over the lake, creating a phenomenon called lake-enhanced precipitation. One of the more challenging aspects of forecasting LES is pinpointing where the heaviest snow will occur. Even small changes in wind direction can change tremendously the areas impacted. The following table shows which areas typically receive the heaviest snowfall, as a function of wind direction. Though LES can occur with any wind direction, it is most common when winds are from the north through southwest.